Well at the time the fastest burner my friends had was the Yamaha 16x burner. I was very much tempted to buy that except for one little problem, it didn't have BURN proof technology. I know, I know what could go wrong in 5 minutes... Well I've seen things go wrong with his burner and I wanted a little insurance. My goal was to be able to still do everything I normally do and burn a CD at the same time. I decided to get Plextor's 16x burner, the PlexWriter 16/10/40. That's where this review comes in. Although I said I didn't really have a need to create my own CDs, just having the burner makes me want to use it. I've gotten quite a lot of use out of it by backing up my data and programs, and creating music CDs. We've come a long way from the old 2X burners, with 24X drives already hitting the market. The Plextor PlexWriter 16/10/40 is still a top contender, especially with the reduced prices. The release of the new 24X PlexWriter will surely lower prices even more. It's very fast, and perfect for those that want speed but don't want to spend over $200. Plextor has been providing high quality CD drives for some time now and this drive is no exception. Hopefully this review will give you some insight into the PlexWriter from a first timers perspective. So let's see what this baby has to offer. ATAPI interface: DMA should be set to ON in operating system. IDE controller must be set to PIO Mode 4 or DMA Mode 2. As you can see the drive supports a wide variety of CD formats as well as read/write speeds and methods. 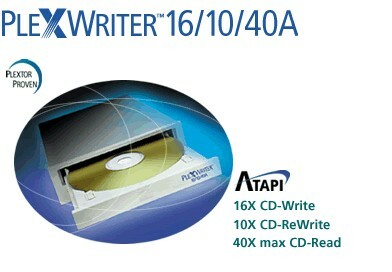 Not only is it a 16X writer, it also rewrites at 10X, and acts as a 40X CDROM drive. You'll see a little later in the review whether or not the drive lives up to the specs. The software that comes with the drive is your basic Adaptec Easy CD Creator, Direct CD, and Plextor's own PlextorManager and Liquid Player. Of course, you can install your favorite CD burning software instead. Since I'm just using the burner for regular stuff like data CDs and audio CDs, the Adaptec software is fine by me. The more advanced user will want to use other CDR software out there such as Nero or CDRWIN. As stated earlier, this drive has Burn-Proof technology that eliminates buffer underrun errors, so you don't get that coaster effect on your CDs. The 2MB buffer doesn't seem like much, but it's enough because of the Burn-Proof. For those not in the know, the coaster effect is when you ruin a CD, as a result turning it into a coaster. Burn-Proof was developed by Sanyo and is present in this drive. Other burners out there also use this same Sanyo drive and have the Burn-Proof technology as well. You can rest easy and continue with your daily routine knowing that most anything you do won't damage the CD. I know you music enthusiasts out there are going to want to be able to extract your audio fast, and this drive certainly satisfies those cravings. Although not as fast as other dedicated CDROM drives on the market, it still adds a valuable feature to your system. Not ever having my own burner before, I was very excited to finally get one. I eagerly ripped open the packaging once I got the drive. The unit is very nicely packed in the box with protective foam. I always love to see how manufacturers package their products. It shows how much attention they pay to detail and quality. Plextor is definitely not slacking off on the quality side of things. The box contained the documentation, the install CD, some mounting screws, a CD-R and CD-RW, and of course the drive itself. The drive itself is a Sanyo drive, and is very well constructed. It even has a rear fan to help cool it down because at these speeds and with a laser, it's bound to get hot. My Antec SX1030B has those drive rails so installing the drive was easy. Seeing the drive in place brought a tear to my eye... I finally had a CD burner. It seemed surreal to see that I actually had a Plextor PlexWriter installed in my case. Well I guess it's only a CD Burner, not like a UFO sighting or being face to face to Britney Spear's breasts or anything like that. Even so, this is my first ever CD recorder, and it felt mighty good actually having one. No more asking other people if I want to record something. Now the people come to me. Anyway back to the installation... After connecting the drive to the motherboard and the audio connector to the sound card I was good to go. Windows 2000 detected the drive correctly. Then I proceeded to install the Adaptec Software from the Plextor CD. I elected not to install the PlextorManager and Liquid Audio Player since I really didn't need those programs cluttering up my desktop. The Adaptec software adds some more icons to your system tray by default. If you're trying to conserve system resources, you'll want to remove those pesky programs. Since I have 512 MB of memory, a couple more things won't really bog down my system, so I left them running. Everything went fine and finally I was almost ready to test this baby out. Before testing any new hardware, I always go to the manufacturer's website and see if they have any updated drivers, firmware updates or things of that nature. I want to make sure the product is as bug free as I can get it, and so nothing will taint the performance results. It so happens that a new firmware upgrade was released on July 5. The upgrade adds a few improvements including better reliability by lowering the operating temperature (good for my system :)), improved read performance of CD-RW media, added the PowerRec feature, plus a few more. The PowerRec feature makes the drive automatically determine the media manufacturer, its part number and disc characteristics and then sets the appropriate laser power and write speed for any given disc. This process guarantees that the written disc has the highest quality playback, which is always a good thing. Now that everything was set up properly, I could hardly wait to burn my first ever CD on my own machine. Ok so now everything is installed and ready to go, let's do some performance testing. For the synthetic testing I use the following applications, CD Speed 99 and SiSoft Sandra. To have some outside comparison for at least just the read speeds, I also benchmarked my Mitsumi 48X CDROM. For all these tests I use a data CD with a 649 MB file that was actually made by the GP Bench/CD program. As with all synthetic tests, these might not translate into real world performance. Unless you're running a system that's identical to mine in everyway, your results will probably vary but hopefully not by that much. The above SiSoft Sandra scores were a bit surprising. The Mitsumi drive performs at least higher than the 32X reference drive, but it's not as high as it should be. The Plextor actually does worse compared to the reference drive, even though it's supposed to be a 40X reader. I guess the main thing here is that this drive is mainly built to write. I mean don't get me wrong, the read speed is nothing to sneeze at but it's still not up to the increasing speeds of CD drives on the market. If you ask me though, the 40X is plenty fast for normal applications. Ripping music CDs at that speed is sufficient for most people out there, unless you're the most impatient person in the world. The truly geeky or performance hungry will get the higher speed CDROMs to do that for them. Then again this is only a synthetic benchmark, so it will not totally reflect normal working conditions. In the next set of tests I try actual real world tests here. First is the transfer speed. I see how long it takes to copy the 649 MB from the CD to my hard drive for both the PlexWriter and the Mitsumi drive. Hopefully it will show just how much faster a 48X drive is when directly transferring data. I measure from the time I press paste, to the time the copy dialog box disappears. As expected the Mitsumi scores higher, a good 22 seconds faster than the Plextor. You'll feel this difference more in stuff like Digital Audio Extraction where transfer speed is the key. Games that still use CDs pretty much run fine with 32X drives or higher. Normal applications that run off CDs probably won't feel any difference in the Plextor drive compared to the Mitsumi one. So, 40X vs. 48X isn't going to make that much of a performance difference there. This second test is actual burning the 649 MB file to a blank CD, and recording the "real" time it took from the time you press record to finish, and not the time displayed by the program. Usually the actual burning doesn't start until everything is prepared, and this can take a little longer. I'm copying at 16X right away here, no testing or anything. The clock starts once I press the copy button and the clock stops once I see that CD was created successfully message. The result? 5 minutes and 39 seconds. Not bad I would say. Not exactly the 5 minute flat record time I was hoping for but with the overhead it's still very fast. I mean I'm used to waiting for my CDs to finish. Now I just turn to the TV and a few minutes later BAM! the CD is ready without any troubles. The Burn-Proof technology is definitely getting a thumbs up from me. I did some hard drive benchmarks as I was burning and playing Q3, and it didn't even flinch. Other CD recorders have large buffers to lessen the chance of buffer underruns, but this drive doesn't need that much. Were was this a couple of years ago so I could have saved some money on ruined CDs. This drive also acts as a ReWriter and came with a CD-RW that supports the 10X rewrite speed. You should always make sure the CD-R or CD-RW media you're using is high quality and supports the speed you want to write at. The CD-RWs are great because you can use them pretty much like floppy discs. So the next test was to see how well a ReWriter this drive is. As most people that have used CD-RWs know, it's a pain to erase these things. The software provided two ways of doing this, Quick Erase and Full Erase. Doing a quick one doesn't ensure the entire disc is erased so I decided to test out the full erase. The erase took pretty long, approximately 8 minutes. The quick erase only takes like 25 seconds. I'm not really sure what problems might arise from using only the quick erase, but you know me, better safe than sorry. After the erase it was time to see how fast it recorded on a CD-RW. Same rules applied here, clock starts once the copy button is pressed etc. The entire creation process took 8 minutes and 33 seconds, not bad for 10X. The Adaptec DirectCD software allowed you to turn your CD-RW into a floppy type CD. All you do is drag and drop files and it automatically copies over. That sounds like a convenient way to do it so I tried it out. The DirectCD wizard guides you through the whole process. First, you need to format the CD-R/CD-RW, which took me around 18 minutes for my CD-RW. After that I was ready to go. It was pretty cool just dragging and dropping files to the CD drive. It acted just like a normal hard drive. You can remove the disc from the recorder and put it back in again later to have the same functionality. You didn't need to open up EasyCD Creator at all, which I guess is a good thing if you don't want to go through those applications. It's fast and a lot more convenient if you want to just be able to put data to CD quickly and change it whenever you want. I guess that's it for performance. The drive over-all lived up to my expectations. Not the flat 5 minute CD burn I wanted but it was damn close. So Now That I Have A Burner What Do I Do With It? Well now that I have this thing, do I really make use of it? I mean I didn't have my own burner ever before because I never really saw a need for me to use one often enough. However, having one now makes a whole world of difference. I promptly made backups of all the necessary data on my system. I plan to use Ghost to make images of my drives so that I don't have to worry about going through a grueling install again. Then I began seeing myself using the device more and more, creating my own music CDs that I listen to at work or in the car, extracting audio from music CDs I had already, and a few other things I'd rather not mention here ;). It was also good because I not only had a writer but also a rewriter. I could easily transfer information from my home PC to the one at work and vice versa. The ReWritable definitely saves on CD-Rs, and the 10X speed of this drive is definitely fast enough for me. The DirectCD software from Adaptec is pretty convenient when you're constantly changing the files on the CD-RW. At the moment, you can get a PlexWriter 16/10/40 for around $170-180, which is not a bad deal at all considering the drive cost over $200 a couple months ago. There are other 16X drives out there that cost less but they might not have the same software, feature set, and quality that Plextor brings to its drives. You can actually get the same Sanyo drive that Plextor uses for less, but it's OEM. TDK also sells the same unit but bundles different software. I've been happy with the performance of this drive so far. New 20+X drives are hitting the market now, but those will run you closer to $200 and over, and some don't even come with the Burn-Proof technology. If you're looking for a budget burner, this might not be for you though. Getting a bare Sanyo drive would probably be better if you already had your own software. Then again you won't be able to say you have a Plextor drive :)... I remember when Plextor was like a status symbol around my school since not many people had them. You're pretty much buying the brand name for the slightly higher price. It's really up to you and your budget if it's worth it or not. Well I've gone through pretty much all I can, and I must say I've been satisfied with what this drive can do. I've had it for a few weeks now and it hasn't let me down yet. I have been using a lot, so don't think it hasn't been put through its paces. The performance numbers I have correspond to what you would expect. It burns a CD in approximately 5 minutes 39 seconds over-all time. The drive construction and feature set is excellent. The only small downside is that it didn't come with more software. It did have all the necessities covered though. What can I say, the drive is great. That's especially true with the lower price and recent rebate offer. Of course, there are cheaper drives out there but you know you're getting quality with Plextor. The 16/10/40 isn't the latest and greatest anymore, but it's hard to keep up with the technology curve. It's expensive to keep up on cutting edge technology, that's why this drive is a great value. It provides you with cutting edge performance at an affordable price. Plextor has recently released their own 24/10/40 drive, which has pretty much all the features of it's predecessor except only faster. That means the price of this drive is likely to go down as the newer, faster drives start getting their own share of the market. That would make an even better value. So, who do I recommend this drive to? Those that want quality and are willing to pay more for it. This drive isn't for the speed freak as there are faster ones out there, but for the budget conscious speed freak, it just might hit the spot. There's just something about the name Plextor... that's not to say this drive isn't without its faults. It's more expensive than other 16X drives on the market, and even some higher speed drives. I paid over $200 for this drive a couple months ago, and it's now in the $170s. I should probably have waited but what can you do... Also, the software bundled with the drive isn't anything special, just your normal Adaptec package. The Plextor specific software is ok I guess but not really necessary. So, over-all the drive met my expectations and didn't disappoint, that's why I'm giving it a score of 8.5/10. It's my first burner, and I'm definitely happy to finally have one.